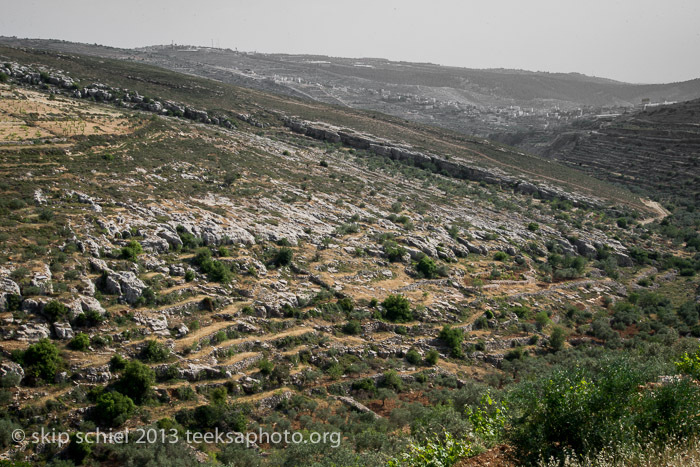 Hassan Muamer of the Battir Landscape EcoMuseum, an initiative, with the help of UNESCO, that has been dedicated to restoring and sustaining the environmental stability of Battir, continues to fight the human rights violations presented by the wall. 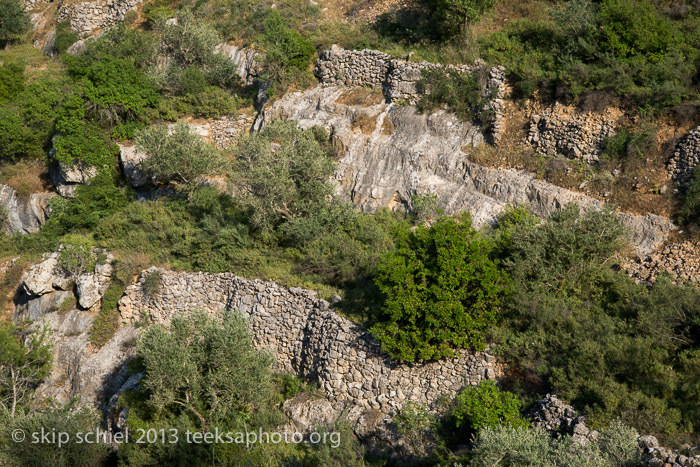 Yesterday [April 30, 2013] was the Battir terraces tour that I’ve long hoped to photograph after G suggested it months ago. With J, the new volunteer at the news agency where I also volunteer as a photographer, G guided us thru some of the terrace landscape. 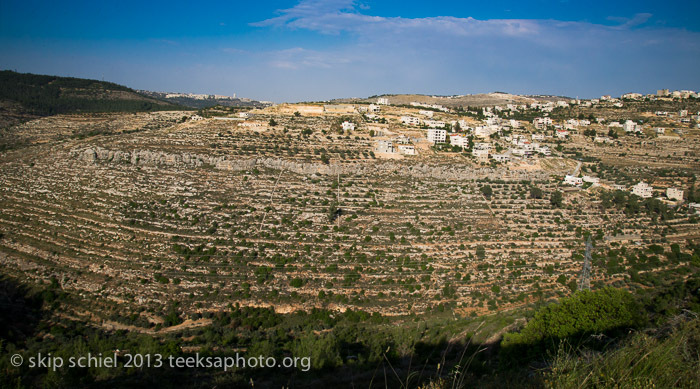 Not the Palestinian village of Battir itself, however; this she promised for later, maybe an early morning walk, most importantly with a Palestinian guide rather than herself, an Israeli. Much of the tour was on foot, usually mild inclines and declines. When she suggested a rougher walk I demurred, stated, I might need to walk slower than you both, I have knee problems. She suggested a less strenuous route. The terraces are vast. 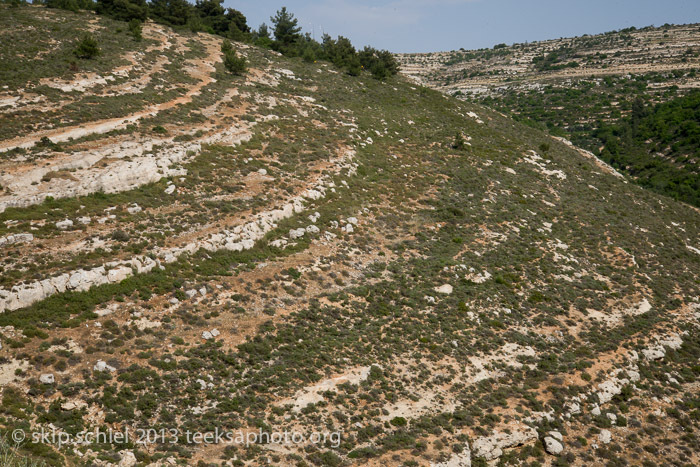 This is one of the areas in Israel-Palestine most dense with terraces, G from Friends of the Earth Middle East (FoEME) thought because it has historically been prime agricultural land, as contrasted with the Galilee for instance. It is more suited to agriculture partially because of the warmer climate. There is archeological evidence that terraces existed here at least 4000 years ago. Of course the main reason for terracing is to increase arable land. Slopes can be converted into small plains by forming rock walls which in turn create the arable flat zones. This also traps rain water. Earlier, people moved the more fertile earth from lower elevations to the terraced plains. Now, G explained, with fertilizers this is no longer necessary. Hills prevent use of machinery so much work is done with donkeys and hand labor. 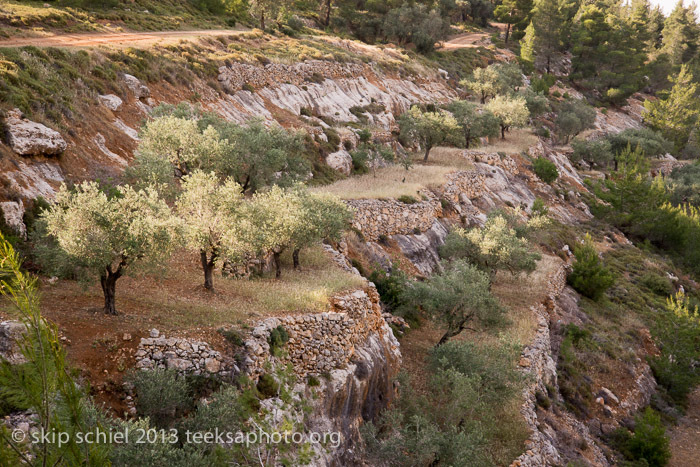 She showed us places where farmers had renovated old terraces and planted, usually olive trees. Some Israeli farmers are using traditional irrigation techniques supplemented by piped water to foster early growth. Maybe Palestinians as well? G showed us cisterns and canals in a small park. Also the ruins of Byzantine structures dating back some 1600 years, olive presses and maybe a church. 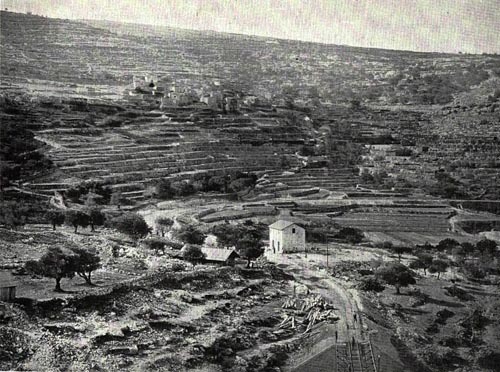 Across the valley she indicated ancient structures built during Roman and Crusader periods, and a hillside now barren which once had been an Arab village. Possibly people recycled the limestone from the buildings into the terrace walls. She also pointed to where an ancient Jewish fortress, Khirbet al-Yahud, once stood. At 2 of the parks people had congregated, one to camp. We saw tour buses at a third site, but the hikers may have been on other trails. Photographing all this in an effective way was challenging. Much the same challenge I face with my water theme: how to make interesting photos of intrinsically fascinating scenes when seen with the unaided eye and with commentary but that do not necessarily lend themselves to photography? J also made photos and we shall compare. Perhaps I can learn from her, she from me. G leads an excellent tour. She’s done this many times, knows the hills intimately, walks and rides horses over them. She knows history, ecology, geology and other areas that fuse together so she can present an overall view of the terraces. She is empathetic with human needs and rights, often referred to the human being as central in the argument of what to do about the Separation Barrier (called by some the Apartheid Wall) and the terraces. In fact, the proposed route of the Barrier in this region is what motivates concern for the terraces. Many would be destroyed if the wall/fence is built according to plan. At the moment this is being adjudicated in Israel’s high court—potentially a landmark legal case for Palestine-Israel. 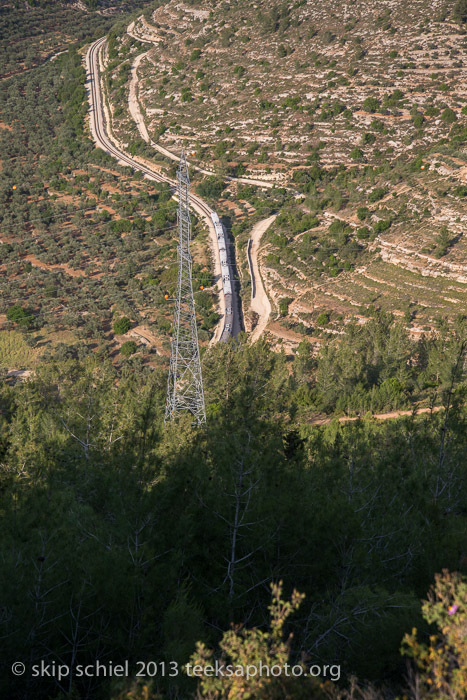 With a curious combination of influence groups: the Israeli Defence Ministry argues on the basis of security, the Israel Nature and Parks Authority and Friends of the Earth Middle East for environmental integrity, and local Battir village residents for their human rights—they demand no barrier of any form. G claimed this is the highest adjudication level of an environmental issue possibly superseding the all-powerful motive or justification of security. Of course the scales would tilt dramatically toward security should Palestinians attack Israelis violently. Such a precarious balance. Returning from the terraces’ tour we cruised thru Tsur Hadassah, an Israeli town on the Green Line near Wadi Fukin which I visited in 2007 with FoEME (pronounced FOE-ME). And skirted around Betar Illit, the illegal settlement nearby that often—unintentionally, G claimed—spills raw sewage down the slopes into Wadi Fukin. 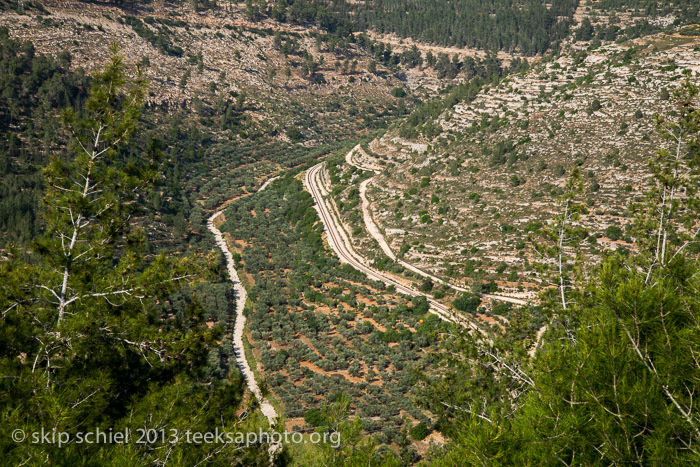 Thus potentially ruining the ancient agricultural practices of Wadi Fukin. She did not wish to bring us to Battir village itself, feeling justly that this part of the tour should best be led by a Palestinian. So that remains to be done. 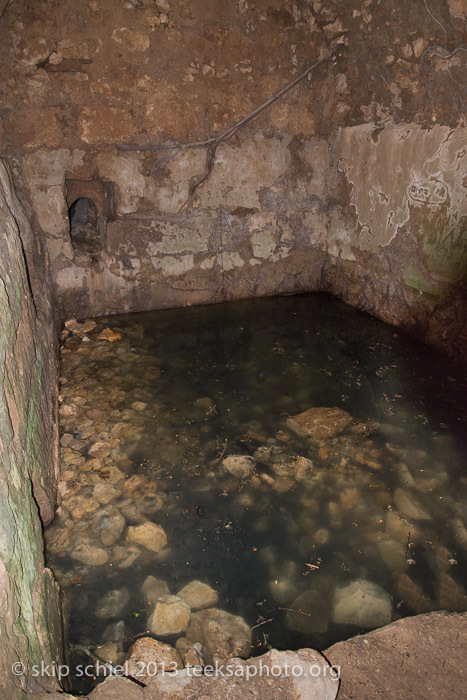 She also mentioned other events we could be part of, such as the cistern exhibit on May 27, 2013. G spotted “illegal” workers in the bushes along one of the small roads. She explained that they are walking across the fields and terraces between Palestine and Israel, working in Israel. Many Israelis never notice this—or choose not to. I did not see the men. I did not even think to look for them. I am impressed with how many people, multitudes across the millennia, not knowing each other, contribute to terraces. Rock upon rock, field after field, labor spans centuries. People who never actually meet reach out their hands in friendship. Together they build and use the terraces. 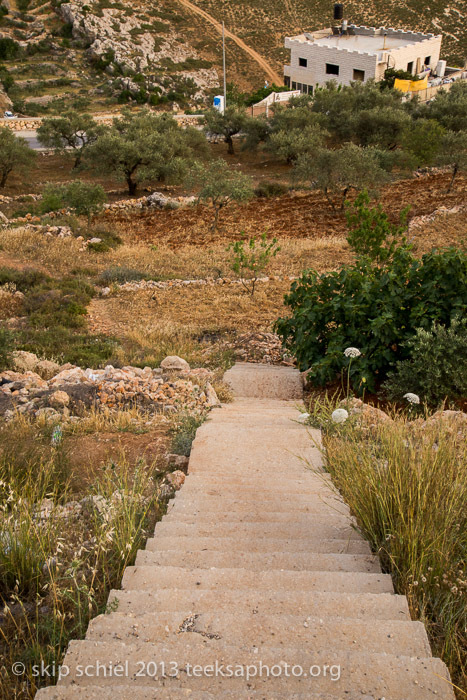 At UNESCO’s World Heritage Committee meeting next month, the terraces at Batir will come up for recognition as a World Heritage Site. The terraces are watered by an ancient system of springs, pools and wells. 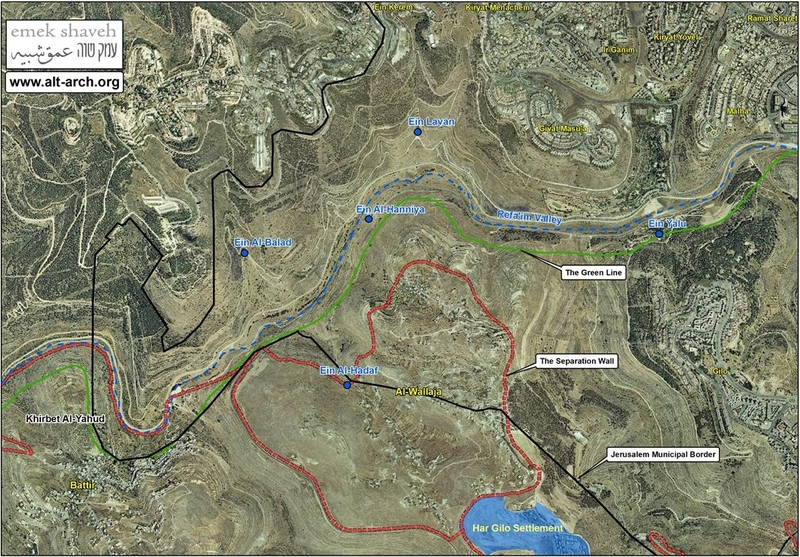 In addition to destroying the watering system, residents say, the part of the barrier in the Refaim streambed next to the Green Line, or Israel’s pre-1967 border, could separate the villagers from 740 acres of their land. Sheer ignorance or political manipulation? Thank you Hassan. I hope your best present will come very soon by Unesco World Heritage – this please, could make evident that common sense and Humanity can take place on violence, destruction, and corruption. Thank you for this paper. Battir and its Villagers need all our attention and help, to make their History and Example for Peace and Respect anywhere in the world. Humanity can take place on violence, destruction, and corruption.